Last week I received brochures from both The Platinum Guild and World Gold Council, espousing the benefits of their respective metals. However, during the purchasing process many consumers take advice from a jewellery sales person and end up bereft of any useful facts on the subject. 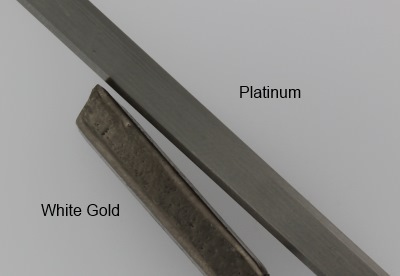 The fact of the matter is, is that both white gold and platinum both have their own unique properties and hence benefits. By and large, many of these are not explained too well to the would be jewellery buyer, but are outlined below. Two properties of metals that aren’t well understood by the jewellery industry as a whole and jewellery consumers are hardness and malleability. In fact, when I told my own jewellers that platinum was softer than white gold, I received nothing but protests. Put simply, hardness refers to a metal’s resistance to scratching and denting. A hard metal, just like diamond, the hardest material known, will be resistant to scratches, whilst a soft metal will scratch easily. Malleability refers to how easy a metal is to bend and turn into different shapes without breaking. A malleable metal will bend easily, whilst a brittle metal will not bend easily. Whilst it may be true that platinum is harder than gold in its purest form, 18kt white gold is mixed with other metals, most commonly palladium, silver and copper to make it harder. This results in 18kt white gold being harder than platinum alloys, which are most commonly 95% platinum. On the other hand, platinum is more brittle than white gold, and is hard to bend and hammer into shape, which may explain the aforementioned protests from my jewellers. What the hardness and malleability of white gold and platinum means in real life is that a platinum ring will be easily scratched and dented, but will hold diamonds and other gemstones more securely, as platinum is less prone to bending due to its brittleness. However, to get the best of both worlds, we have been encouraging our clients to buy rings with a platinum setting and a white gold band. This results in a more secure setting for the centre diamond, whilst the white gold band results in less scratches and dents. 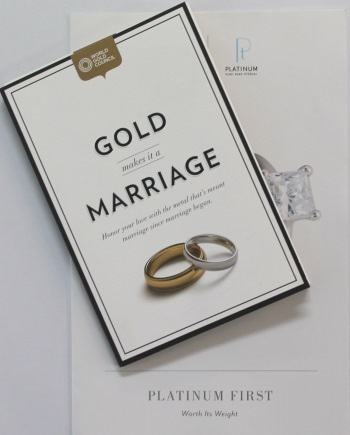 Platinum’s softness versus white gold is also the main reason why we don’t recommend platinum for mens’ wedding rings. Platinum alloys are about 20% denser than white gold. This results in a ring that feels more substantial, and thus more luxurious, even though it may be very fine. Platinum is denser, and thus more material weight is needed to produce the same ring than from white gold. Platinum alloys used in jewellery are purer. Since most platinum alloys are 95% platinum and 18kt white gold is 75% gold, less gold is require to produce an 18kt white gold ring. Platinum is more difficult to work with, and often needs a jeweller with experience to produce a good job. Therefore, the labour cost is roughly 20% more than with white gold. Platinum can not be re-used and re-melted like white gold. Therefore, any scraps and filings must be sent to a refiner which is very expensive. One of the benefits espoused by The Platinum Guild is that platinum is hypoallergenic. Whilst this is true, so is most 18kt white gold, in Australia at least. Whilst nickel was commonly used to alloy white gold in the past, most manufacturing jewellers in Australia use a palladium based alloy that is free from nickel. However, nickel, being a much cheaper metal than palladium is still used widely overseas, and thus some people may suffer from nickel allergies with imported jewellery. One of the myths about white gold is that it is slightly yellow, and thus, requires more maintenance as it needs rhodium plating every year or two. Again, nickel based alloys are more likely to have a yellow tinge, whilst palladium based alloys are more likely to have a dark grey appearance when compared to platinum, as shown below. Above: White gold and Platinum in square wire form. Platinum loses very little weight during day to day wear and indeed, during polishing. Therefore, in theory a platinum ring will last a lot longer without the need for replacing the band. However, a well made ring, whether white gold or platinum should last for generations. White gold is more widely serviceable than platinum, meaning that more jewellers are able to resize and repair white gold jewellery. In addition to this, platinum’s higher melting temperature pose a risk to gemstones and diamonds that may get burnt when repairing platinum jewellery. However, modern tools such as laser welders and an experienced platinum jeweller eliminate these problems. Since gold is a widely traded asset and investment, gold in both pure and alloy form is a lot easier to sell than platinum. Whilst numerous gold buyers have sprung up in recent times, very few of these buy platinum. This entry was written by Nikhil Jogia and was posted on on Thursday, June 6th, 2013 at 3:16 pm	and is filed under Buying Advice. You can follow any responses to this entry through the RSS 2.0 feed. You can leave a response, or trackback from your own site. This is the first intelligible discussion of white gold and platinum that I have found. My son (Ian) and I have bought diamond rings from you in the past and value your advice. I have just bought a beautiful opal stone for my wife’s 80th birthday and I would like to have it set in a pendant in white gold or platinum (preferably platinum). Could you recommend a good jeweller? Please ring us on 1800 722 237 or 08 9218 9865 so we can recommend a jeweller that is local to you. Very descriptive and true, but you can easily remelt platinum or the like by wearing very dark glasses as for oxyacetylene welders operators, then on a crucible without any flux yo use the very center of the torch flame (the hottest area) and melts in seconds! The problem isn’t so much in melting, but melting it into something that doesn’t have cracks or filled with porosity. It’s much less headache to send platinum off to the refiner! What would you recommend for diamond earrings? Platinum setting with white gold stems? Platinum would be good for earrings, but the availability of pre-made Platinum earrings is very limited in Australia. Is it possible to have a 18kt yellow gold ring with platinum setting securing the diamond? The problem with the Jewellery Trade is, there are not enough Jewellers working in it. No Jeweller that has completed their trade course would give the wrong information about hardness and malleability as they would understand the structure and characteristics of the metals they use. The Jewellery Trade in Australia principally consists of retailers selling rubbish and this has become increasingly the case since the mid 70’s. If you want to buy Jewellery of quality and know that you are getting what your paying for ask to speak to the Jeweller and ask to see their trade papers, any good Jeweller will be happy to oblige. So it’s not so much there are things Jewellers don’t want the public to know, it’s more a case of the public dealing with retailers who don’t know. Do yourself a favour and next time you want to purchase good quality Jewellery, seek out a qualified Tradesman / Tradeswoman, after all, you wouldn’t let some backyard plumber or electrician do a couple of grands worth of dodgy work on your home would you? I wanted to ask, My husband bought me an engagement ring for in 2004. We were told the crown that holds the diamond was made of Platinum because it was stronger and would hold the diamond in place much better than white or yellow gold. One of the prongs bent after 9 years so I took the ring off and placed it in a safe place until I could take it in for repair. We purchased it from Whitehalls in Hickory NC… In 2008 they went out of business. After inquiring about a reputable Jeweler to take the ring to we then gave them the ring. They inspected the ring and I told one of the employees that the crown was made of Platinum and one of the post bent and the diamond fell out. She then took the ring to the back to be inspected by the jeweler. Afterwards she came out and told us it would be $48.00 dollars to repair it and it would take a week to get it back. Two weeks went by and I had not heard from them. I called and she said they were waiting on a new crown to be shipped in. I said what crown… No one told me you were having to replace the crown. She said what no one called you and I said no. She put me on hold and came back and said there would not be any additional charge. Another week and a half went by and nothing so and I called them back and spoke with someone else. He said he was still waiting on the crown but should have it ready by the following week. He said they were waiting on the white gold crown and it had been back ordered. I told him the crown was made of Platinum and he told me no he thought it was made of white gold. He said I can do it in Platinum but it will cost you a 100.00 dollars more on top of what they had already quoted me. He said if the ring was made of Platinum it would have had 18k with a pt inside the band. He then gave me this speech of how much more durable the white gold was to set the the diamond into the crown. I told him we were told Platinum was stronger for holding diamonds in place and he said well someone lied to you that is not so, white gold is stronger. Now I am suppose to pick the ring up tomorrow and am confused. All I cared about was making sure my diamond was secure. We paid over $5.000.00 for just the engagement ring. I am now scared because every thing I am reading it says the Platinum is stronger for holding the diamonds in place. I now don’t know if I trust this company. How do I protect myself and is it true that Platinum is stronger for holding the diamond in place. Also one other question.. Being a Jeweler would he not be able to tell the difference between white gold and Platinum. He said you cannot tell the difference by looking at it. He said to even test it he would have to remove the crown away from the yellow gold band because with them together it would give a false reading. Your jeweller is right in saying if it was Platinum, there would be a Platinum stamp or hallmark inside the band, although the original jeweller could have made the fundamental mistake of not stamping it. You can not tell the difference when new between rhodium plated white gold and platinum, but an experienced jeweller should be able to determine the type of metal. Hello there. After only 4 years, a small emerald cut diamond fell out from my eternity ring which is made out of white gold. I noticed that the ring is slightly oval shaped, no longer perfect circle which surprised me, as I am careful with my jewellery. Possible bad workmanship or white gold just not strong enough? Each of the 5 emerald cuts (.20ct) sit horizontal in a line on the top of the ring, and have 4 claws on each. It is best to take the ring back to where you bought it. Hi, I was just wondering if you wear titanium (hardness 6) next to a rhodium plated white gold ring (rhodium is hardness 6 whereas gold is 3) will this cause wear? Also, when people talk of the two metals rubbing and wearing, what kind of time frame are they talking about? Will the rings be significantly damaged within 10 years, say? It really depends on factors such as the design of the two rings and how they are worn. You might want to consult a jeweller and have the two rings soldered or spot welded together. Hi, I have an engagement ring with an 18ct yellow gold band and a diamond claw set in platinum. I am looking at a wedding band with a half band of claw set diamonds set in platinum (half of the band will be 18ct gold and half platinum). I’m wondering whether the platinum claw setting on the wedding band will wear down the gold band on my engagement ring? I would like a ring that wears well over time and preferably won’t need to be reset. I am getting conflicting information from jewelers with one stating the claws on the wedding band will wear down and another stating that platinum claws won’t wear down but may scratch/ wear down the gold engagement ring band. One jeweler recommended a grain set 18ct wedding band rather than claw set – what is your opinion? It’s likely the gold will wear the platinum claws down. A grain set wedder would be a good idea as it will wear well over time. You may also want to investigate joining the wedding band and engagement ring together if you do go for the platinum claw setting. Thank you ao much for this. My diamond white gold wedding ring lasted only for 6 months and than 3 diamonds fell. The jeweler claimed that it was my fault and that I did not take care of it. After the ring was repaired by the same jeweler, one month later, 2 diamonds fell again. I requested refund but jeweler accepts only to redo the ring. What would you suggest? It is difficult to say without looking at the ring. Dude learn how to write. “The fact of the matter is” and “put simply” in the first few paragraphs. I recommend ‘on writing well’ or ‘revising prose’. Some kind of rings brake me out n turn my finger green! About to be married and I do not want to end up suffering every day after I do’s! What kind/type of ring would you recommend that wouldn’t do this? It would be best to ask the person you bought it from what alloy the ring is made from. The most common allergy is from nickel, which is a common metal used in white gold in North America. You may also want to consult your doctor regarding this. Question for you – I had a platinum ring repaired by a jeweler – center stone came loose – and noticed the underside of the ring, looked cleaned up. The ring was not originally made well. I remember there being large lumps of metal underneath & now it’s clean. Is it possible for a jeweler to take out excess metal from the underside of a platinum ring? Viewing in the loop, it sure looks machine manipulated. You will have to ask a jeweller if they can do the work you require, as I can’t comment without seeing the piece. Is 18K white Gold really to soft for a daily ring or is it just what people think? Do most of the ring repairs you do is on 18k not as much on 14 k? Unlike North America, in Australia, we don’t use 14kt gold. I am going to purchasing a .45ct F VVS1 loose diamond from Jogia and want it for an earring stud. I have been told that the best setting would be a screw style stud with 4 claws. What would be the best metal combination for the stud? Platinum would be the best metal if available. Hi Nikhil, I work in a jewellery store and your article has helped me so much in explaining the pros and cons of each metal to customers. Regarding a white gold band with a platinum setting, how are the metals joined together? Given the differences in malleability and hardness of each metal is there a chance that this may compromise the integrity of the setting? I have seen a lot of yellow centre diamonds in a white gold/ white diamond halo setting however with yellow gold claws around the centre stone for aesthetics, would this combination be possible however using platinum rather than the white gold in the halo? Two questions for you out. Firstly what would be a fair price to set a.diamond solitaire in white gold or platinum. Just a plain ring with a 4 claw setting. Secondly do you know any talented jewellers in Brisbane that would do a good job. I got a price of $3500 to do the ring in platinum which I thought seemed excessive for a simple ring. Thank you for your input. The setting is soldered on the the shank using white gold solder, and given most rings are made in two or more pieces, the integrity of the setting is not compromised. Likewise, there is no problem with soldering yellow gold to Platinum. A fair price for a simple Platinum solitaire would be $1300 – $2000. You may want to google “David Lenneberg” as he is a jeweller in Brisbane who specialises in Platinum. I have just had a platinum wedding made in Thailand where I am living at the moment, the guy in the shop told me it would be 5 mm width and about 20g in weight of platinum PT900 plain band with a flat top I wanted it to be thick (heavy), I was very disappointed when I saw the ring, the weight was only 11.5 grams, and not flat on the top, and too big in size. I asked them to melt it down and make a new ring by adding more platinum and to make the ring heavier. They said it was not possible to melt platinum to do this is that true? He said my only option was to have a a new ring made with new platinum, and I will only get scrap weight for the new ring I just had made. For most jewellers, it is not possible to reliably melt Platinum into a reusable form to re-make a ring. The engagement ring I am having made is being constructed from platinum with micropave arrangement of diamonds around 80% of the band. The head setting for the center stone is the V type setting for a princess cut stone. My question is that since the head setting prongs will also have diamonds in micropave style going up the side of the prongs. I was originally told platinum on the band is ok, but I should do the head in white gold instead since it will secure the side diamonds better in day-to-day use, but now I’m unsure with a few articles saying platinum is best to secure at least center stones. Not knowing how this theory relates to microwave, my question is should I still do the head in platinum too or go with white gold to best secure the micropave prong diamonds? Thanks! Platinum would be a better choice for micropave setting. I was told my ring was platinum. Now 36 years later I need to have the ring resized larger. Jeweller told me it was white gold not platinum. It has 18kt stamp. It has never been plated Its colour for many years has been a soft grey/dull silver. From memory, it may have been lighter in col I ur, but it has never been shiny silver. From what I read, white gold can be made 75% gold and either 25% palladium or platinum. How can I ensure that if the ring is enlarged, it is made using the same mixture as the original? An 18kt stamp indicates that it is indeed white gold. A reputable jeweller should be able to size it for you using the same or similar alloy. Hi Nikhil, in the initial stages of ring shopping and the gf wants a pavé setting. Would you recommend a platinum or white gold for the band? After reading your article i am thinking platinum to better hold the smaller diamonds, but you are the expert. Thanks! Yes, I think Platinum would be a better option for pave setting. Hi Nikhil, I just placed an order for 2 white gold 18 Kt wedding bands with brush finish. I am being told it would turn yellow after 1 year and I would have to polish it. What would you suggest, stick with white or go for platinum instead. Thanks in advance. It depends on what the white gold is alloyed with. Palladium alloys will stay very white, whilst nickel based alloys will tend to go yellow. Excellent information on Gold Vs Platinum. Here in Mumbai, India there are very few jewellers who deal in platinum rings or jewellery. The rate of platinum is 20% lower than gold but still the making and wastage is way higher than gold.I have decided to go with platinum for my anniversary gift. Let see how it turns out to be.. Platinum is “brighter” than white gold, which is darker, or greyer than Platinum. In regards to Platinum being re-used – yes – it is possible, but can be very hap-hazard. A few questions: do you know any reputable jewlers in bangkok? I live in bangkok and rings tarnish here due to the heat. – which is best at avoiding this: platinum or whit3 gold? Lastly: I want a round brilliant setting with 4 or 6 prongs (haven’t decided) with a pave band. Should I go for platinum band + all prong settings? (Main diamond too)? I’m not sure about Bangkok, but neither white gold nor Platinum will tarnish. Platinum is a “more secure” metal for holding diamonds. I have recently developed an allergy to my 9k and 14k gold jewellery. I’m assuming it is an allergy to the nickel in the jewellery. Do you think it would be safe to assume that I would be fine with any 18k gold, yellow or white? Or do you recommend switching to white gold or platinum? Also, do you have any recommendations for a jeweller in Brisbane that does 18k gold or platinum earrings without a stone? It would be best to consult a doctor to confirm your allergy and then seek a non nickel based gold or platinum alloy for jewellery. I’m not sure about any jewellers in Brisbane though. I am looking for a plain 2.5-3mm wedding band and was going to go for platinum so I didn’t need to have my ring rhodium played every year, then I saw some posts online about platinum ‘patina’. Do you have any information on this? What does patina mean? My understanding is that the ring turns gray. The patina is the finish that platinum will develop when it is dented and scratched. Generally this only develops on the bottom of the ring, and can be removed by polishing the ring. Great Information about Australia’s Oldest Internet Diamond Merchant, thanks for sharing. Hi Terry – Considering 22 or 24kt gold and platinum are a different colour, it would come down to personal colour choice. Hi, I recently got engaged back in May. A lady I know asked what metal the ring is made from, I said I wasn’t sure, she said I hope it is platinum because white gold will go yellow and have to be plated every couple of years” Is this true and how long does it normally take to get it re plated? Palladium based white gold won’t go yellow, it just lose the bright lustre that rhodium plating offers. In any case, both white gold and platinum rings should be serviced every 1-2 years. My wife dislocated her ring finger. This resulted in her platinum band and engagement rings being cut off to relocate and exray her finger. What is the best way and most cost effective way of repairing or replacing the rings? Repair or melt metal and buy a new one? ( even if it different metal?) sorry for my nativity in asking. You may want to visit a few jewellers to get quotes and their opinion on whether or not they can be repaired or they need to be re-made. I am looking at getting a platinum engagement ring with pave diamonds on the band but a rose gold wedding ring. Is that possible or would you recommend getting a platinum wedding ring too? It sounds like an attractive combination. However, be aware that different metals have different hardnesses, so one may wear the other down slightly if worn together. I’m considering a Tacori men’s wedding band (104-7). I’m so confused on which metal to go with. Every jeweler has told me something different. I’m torn between platinum and 18k white gold. What are your thoughts and why? Definitely white gold for a mens wedding ring as if you’re rough with wedding bands then platinum will scratch easier than white gold. I have a platinum wedding band with 11 channel set diamonds along the top. Five years ago I brought it to a reputable private jeweler to have it sized up after having children. Several months after having it resized, a crack appeared in the very bottom of the ring. Shortly after that, a second crack line appeared. I brought it back to the jeweler and they said they would repair it at their cost. About a a year and a half or so after that, the same thing occurred. Two cracks appeared in the exact same spot. This time it actually cracked open entirely. I brought it back to the jeweler. They again said they would repair it. When they gave it back to me after that repair, they pointed out to me visible pitting in the bottom of the band. He said he didn’t know why it kept happening, but that it would probably crack again at some point. He said his recommendation was to wear it until it cracked and then have the shank replaced entirely. I brought it to a second private jeweler who inspected it and said that, yes, it was pitted and weak and that in his opinion they were making it too thin, as thin as possible while still staying within guidelines. So a year went by and the two cracks appeared again. This past weekend (another year later) it cracked open. I brought it back to the jeweler again and this time he said he is replacing the bottom half of the shank entirely. I told him what the other jeweler said about it being too thin and he said he would make it thicker this time. So after all that, and reading what you said above, I am wondering if it is weak and cracking also because they are trying to melt the platinum themselves instead of sending it to be refined as you mentioned. Any thoughts on this? I’m not sure what my next step should be if I once again get it back and cracks appear. If the “cracks” were “clean”, they would most likely be the joins where the piece has been added to size it up. Unfortunately, some jewellers aren’t too experienced with Platinum and I’ve seen some shocking resizes done by other jewellers. My daughter has always had allergies to cheap metal jewelry so she stopped wearing earrings in her pierced ears. Recently I bought her 10k white gold earrings for her birthday. Seems that she is allergic to them. (When I say allergic; she wore them to work and was fine. Two weeks later she wore them again and they made her ear piercings bleed and hurt). Can you recommend the next step in metals for her to try? Try asking for a hypo-allergenic alloy. Does a white gold bracelet, stamped 18K have 18K yellow gold underneath or a lesser gold. Is the 18K relating to the white gold coating or the actual yellow gold. Reason being that I am being told that even though it is stamped 18K, that the yellow gold under the white gold coating is only 9K. It was sold as 18K white gold. An 18kt stamp means that the entire item is 18kt, at least it should be. You may want to get the gold independently tested if you are concerned about the purity. Hi! I have a plain 14k white gold 2mm wedding band purchased in the states, where I reside, that has considerably yellowed over the 1 year since purchase. I was considering replacing it with a plain 2mm 950 platinum band but after reading your article it seems like a white gold band purchased from Australia, or somewhere that uses palladium instead of nickel alloys might be a better choice. Can you recommend how/where to purchase a white gold band that will not yellow for a customer in the U.S.? Thanks!! Try asking a manufacturing jeweller, as opposed to a jeweller retailer as they will most likely use a palladium based alloy. Is 9ct white gold available/possible? Two of these fine bands spiral up around a solitaire diamond. I really don’t want to loose any of the small diamonds but don’t know what metal would be save for thin bands standing up like that. I know 18ct is harder/stronger than 24. So is 9ct an option? I am looking to purchase a 1ct diamond pendant on a spiga chain. Would the chain and fixing be better in white gold or platinum? I would recommend Platinum, however, Platinum chains can be hard to come by. How would recommend selling a used gents wedding ring (Peter W Beck, platinum) for best return in Perth? Directly to refiners? Do they deal with the public direct? I would be best to ask one of the many gold buyers either in Perth or online. Many are attached or affiliated with refiners. Hi, We’re hoping to have an edwardian vibe engagement ring created, either filigree or engraving with a low set 6mm OEC and possibly a handful of tiny scattered singles, if any at all. Mini dome style, where it flares out east/west but will still only be 7-8mm north/south, if that makes any sense, and hopefully no taller than 6mm off the finger. I can find a link to similar examples if you would like. I have two jewellers in mind, one is an unknown offering all the nickel free alloys 9k, 10k, 14k and 18k and also platinum in decent weights. The other is a local old family jewellers in the UK so only 9k and 18k or platinum (possible astronomical price with them), probably lighter weight creations but with years of decent reputation behind them. Keeping the budget low is a big deal but we also don’t want to have false economy, buying the cheapest and have to keep repairing the ring or lose stones. Especially the OEC it was a wonderful find. She’s sentimental so will wear it constantly, only ever taking it off for cleaning/sleeping/manual jobs. Which metal or metals would you recommend for this project please? And if you have an opinion on which jeweller to go for that would be a great bonus. Thank you for this article, it’s given me hope we may be able to finally get the ring we’ve been searching for 15 years now! Platinum would be the best for that style of ring if your budget allows. Hi, we got an engagement ring made (with a stone we supplied) in 18ct white gold from a design the jeweler found for us. It has since greyed and I get a reaction from wearing it. The jeweler says it needs rhodium coating every 12-18 months which we weren’t aware of. We purchased a wedding ring from the same jeweler which is also plain 18ct white gold and this hasn’t tarnished. A different jeweler said the engagement ring has nickel in it and looks like it is from overseas whereas the wedding ring was made in Australia and most likely doesn’t contain nickel as it hasn’t tarnished and is brighter. We are in the process of having my engagement ring made and are going with a simple french pave band, with a low set 4 prongs. The center stone is 2.9 carats. I have heard conflicting information on the pros and cons of white gold versus platinum as far as maintenance as well as the security of the center stone. The jeweler has recommended white gold as being more secure but I’d like a second opinion. Platinum would hold the diamond in more securely. I am interested in getting white gold engagement and wedding rings. I live in West Lafayette, Indiana and my zipcode is 47906. Would you be able to tell me which if any jewelers in my area sell white gold engagement and wedding rings that don’t have nickel in them. I am not allergic to nickel but I have sensitive skin and I am pretty sure that I am senstive to nickel. Thanks much! What would you recommend for platinum chains. You say platinum setting woth white gold band is good for rings. What about platinum chains. What are merits and demerits of platinum chains. Are platinum jewels are valued same after few years if we go to sale them or to get it exchanged with some other jewel piece as it loses some weight during day to day wear. Does it also need polishing time to time. And are they can be remoulded after few years? Platinum chains should only be used for platinum pendants. Platinum (or any other jewellery) shouldn’t lose any weight from day to day wear. Similarly, all jewellery will require polishing and servicing at some point in time. Some jewellers can reuse the platinum, but most can not, unlike gold. We have found we can successfully melt up small amounts of platinum off cuts into a small bar with the right temperature flame, crucible, a non iridium based alloy and no more than 30 gms of off cuts, we can reuse for wedding rings and shanks but use virgin alloy for the settings every time. I’ve been looking into ‘stacking’ rings, can you wear a white/rose gold ring with a platinum ring? Yes, you can, but the gold rings might wear the platinum rings down as gold alloys are harder than purer platinum alloys. I just bought my wife a 4ct diamond and am having a jeweler design and make her a 2 tone ring, 18K yellow and 14K white. I wanted to set the 4ct diamond in 4 prong Platinum, he is strongly suggesting 14k white with 6 prongs. what’s your opinion? I wanted 4 prong to be able to better see the diamond. also fo note she is planning on this being an everyday wearer.. I would definitely recommend Platinum. Can you advise whether white gold or platinum is better for a chain for a pendant. The pendant is a reasonable size and made of white gold and diamonds, and so I would like the least likely chain to break. Also the person its for is sensitive to silver, at least in earrings. Thank you. Since most white gold contains silver, platinum would be a better option if you are concerned about an alergic reaction to silver. However, white gold chains are far more prevalent than platinum chains. Could you kindly recommend a or a couple of reputable jeweler(s) in Melbourne who can redesign my engagement ring. It is currently a trilogy design, the band is 24k gold but would like to change band into either white gold or.platinum. Would you also recommend a platinum setting and white gold band for this? Happy to be guided by your advice. Hi Jill – Try Klepners on Little Collins St.
Hi Nikhil, I recently bought a 18k white gold diamond ring because the jeweller said platinum is softer, more prone to scratches and more prone to jewel lost (falls off) especially for 1 carat and above. He said 18k white gold is stronger and cheaper. I was convinced because I did not want my diamond to fall off as I will be wearing it daily. After reading your article, is he right on everything except jewel lost? Platinum is less prone to bending, so if the diamond is claw set, then it will take a little more force to say bend the claws than 18kt white gold. Platinum is softer so it is more prone to scratching and denting. That said, both platinum and 18kt white gold are fine choices for an engagement ring. I’m looking to buy a diamond cross. I want to buy a very good quality one to have forever. Would you suggest platinum or white gold is better for long term wear. I was thinking platinum as you need to replate the rhodium in white gold. Your blog is very informative but I think I’m more confused about choosing the metal now. What would you suggest? Also do you suggest anywhere in Sydney to buy a good quality one? For a cross, the choice of metal wouldn’t be too critical as it won’t be subjected to any force like an engagement ring. Given it is a pendant, white gold is far more common and the availability of white gold chains is far more prevalent than platinum chains.